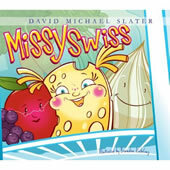 Missy Swiss wants to be the Big Cheese in the fridge, just like her hero, Cheese Louise. So when the family goes on vacation, she jumps at the chance to strut her stuff. But the plug gets pulled on her plan in a hurry, and everyone is going to spoil! Will Missy learn the true meaning of hero before it’s too late? Slater’s Cheese Louise saved the day in the book of the same name. Here, her successor, Missy Swiss, follows in her cheese-steps to foil a nasty cat’s perfidy. Delicious puns infuse the tale so that kids and adults will both enjoy the exciting tale about what our food is doing while we’re not around. It’s just as cool as the other side of the refrigerator. This nifty little book is about unlikely heroes. Children’s imaginations will be tickled by a world they are familiar with, a refrigerator filled with food, and yet food with a community of characters who work together for the common good. Clever, punny and funny. Previous Previous post: Cheese Louise!